Some people who trade differently to the above therefore may not neccessarily see the following trades as potential good opportunities and that’s to be expected. These are therefore just a selection of trades i’ve found which ‘I’ think look good and suit my style nicely. I’ll also make the point that whilst i’ve found these trades i’m not currently trading them. This is simply down to my trading limits I have set myself to stop myself overtrading. Trust me, if I had the capital i’d be placing some bets after the weekend. However i’ve set myself some strong fund management rules and if I start breaking them I’m certain i’ll end up regretting it. I’ve identified 4 trades I like the look of. This trade has been trending long now since early 2010. Back then you could buy at 70.00, today it’s running at 1496.00. It’s taken a couple of small dips along the way but it’s been steadily going up for a long time. One of those dips you will see was quite recently and i’ve been keeping an eye on it to see if the price would go back up. In the last couple of days its shot back up, crossing the 100 and 50 day MA. It’s not far from being back to it’s highest level throughout this trend and coupld be the sign of it continuing. These are all indicators to me that I should buy now and place a stop just below the 50 DMA. You never know, it could go on to make another 1000 pts over the next year. An italian stock I found whilst searching through IG Index’s myriad of selectable stocks across the world. I wanted to find something italian so I had a non UK/US stock in my open positions to help build a healthy mix of trades. This is also a shorting trend which started in Dec 2010 when it went below the 50 and 100 day MA. I know nothing about the company, what they do, or what their company forecasts are. Nor do I need to know. I could go short on this tomorrow and find it shifts back up hitting my affordable stop, or the trend could continue on for another month, six months or maybe even years making me a sizeable profit. This’d be a trade I’d be willing to put a punt on continuing to fall. 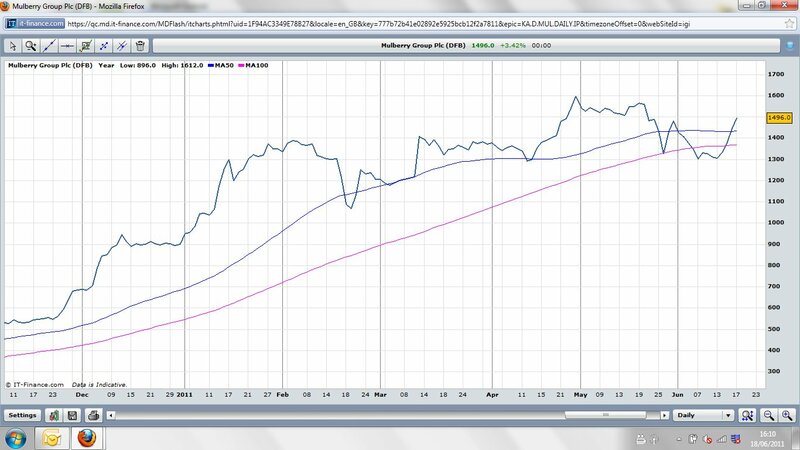 A Hong Kong stock that has been shorting since Nov 2010. Recently the fall has become more rapid and much like Dada’s situation it could continue to fall. Worth a go. Despite the name this is actually a Norwegian stock. I’ve placed an emphasis on shorting trends because my current portfolio is mainly a selection of Long bets and I need some shorts to balance it all out. Again a strong, long, steady downward trend that could go on for ages. No harm in trying as long as I used an affordable stop loss if it didn’t work out. I’d probabaly place my stop just above the 50 day MA. If things went my way i’d trail it manually. So that’s it. 4 random trades that in my eyes look good. If the opportunity arises I’ll go in on some of these at the end of the month depending on what they do over the next week or two. Bearing in mind i’m looking at 6 months to a years worth of data, a few weeks movement won;t make a lot of difference I expect.